Omkara and Rudra’s support towards Anika anger Shivay. They want to unite Shivika. Dadi tells Anika that she won’t accept her as Shivay’s wife, till Shivay accepts her. Tia asks Shivay what’s happening, that Omkara and Rudra have gone mad after Anika. Shivay asks Tia not to worry, he will see Anika and make sure that she leaves the house. He goes to Anika and scolds her for breaking his family. He asks Anika why is she convincing his brothers by shedding fake tears. He blames her for using Priyanka, Daksh and now Omkara and Rudra. He asks her what magic she does on the men, that they all take her side. He accuses her for making his brothers against him. He tells her that she can’t win his heart, she can’t win the game since he doesn’t lose ever. He takes her to his room, asking her to fulfill a wife’s duty. She gets scared of him. He vents out anger on Anika and leaves her free. They get tangled. She tells him that though he is mistaken by the manipulations done by Daksh, she will get justice by Lord. She tells him that very soon he will also be able to see the truth. She goes away and shivers in cold. Shivay gets to see her threading the mangalsutra again. Shivika get a new version of O Jaana. Their moments stay the same. 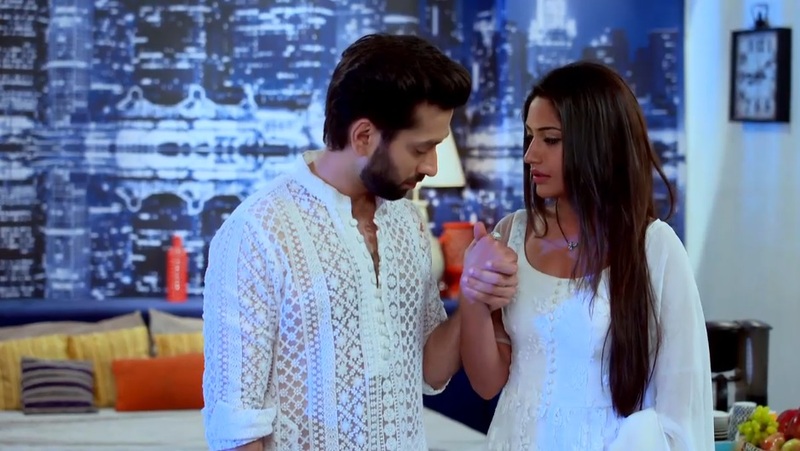 Shivay turns caring towards her and passes a quilt to her, which she witnesses. She sees his humble side again and gets puzzled over his dual behavior. Shivay begs Priyanka to get up and come back to him. Anika sees him shedding tears. She wonders if he is the same man who ruined her life like a devil. She knows Shivay more. Omkara and Rudra get ahead with the arrangements for the big puja kept for Priyanka’s welfare. Omkara asks Rudra to invite Anika, while Rudra is scared of Shivay’s anger. Omkara tells Rudra that Shivay is already did much wrong, its time to correct everything by getting Anika her rights. They want to make sure that Anika gets her deserving respect and place in the house. Rudra doesn’t find Anika in the guest room. He gets a big shock when he sees Anika with Shivay in his room. He thinks how did Shivay accept Anika in his room. He gets happy that things are progressing the right way. Shivay gets silent when Anika is around. Rudra pulls his leg over sharing the space with Anika. He asks Shivay not to be confused over his own feelings. He asks Anika to come in the puja, knowing Anika is Priyanka’s well wisher. Anika wonders what will she do in the puja, when she has no necessities available. Shivay learns her problem. Rudra tells Omkara that Anika reached Shivay’s room by Shivay’s wish. They wonder why was Shivay denying the marriage if he had to take his wife to his room. Gauri gets Anika’s clothes and belongings to help her out. Omkara introduces Gauri to Rudra. Omkara helps Gauri. Anika gets glad to meet Gauri. The sisters share an emotional moment. Gauri tells Anika that she hopes that Anika stays happy with Shivay. She asks Anika if Shivay is troubling her. 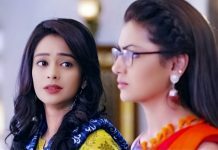 Anika tells Gauri that they have just seen Shivay’s rage, he has a soft heart, everything happened because of misunderstandings, Shivay is taking good care of her. Shivay gets surprised seeing Anika lying to Gauri and keeping his respect. Gauri asks Anika to tell her if there is any problem, she won’t leave Shivay if he troubles her sister. Shivay gets to see Anika’s other side. Anika doesn’t share her sorrow with Gauri. Shivay wants to know Anika’s truth. He confronts Anika for lying to Gauri. He asks Anika if she has no self-respect to stay back after bearing so much humiliation. He doubts on her intentions. 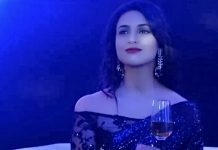 Anika shows her bold side to Shivay. Anika asks him to stop barging his dirt thoughts into her mind. She tells him that Gauri is her sister, they have respect too, she can do anything to safeguard her sister from sorrow. She warns Shivay against taking advantage of her decency. She challenges him that he will accept her as wife with all the respect one day.